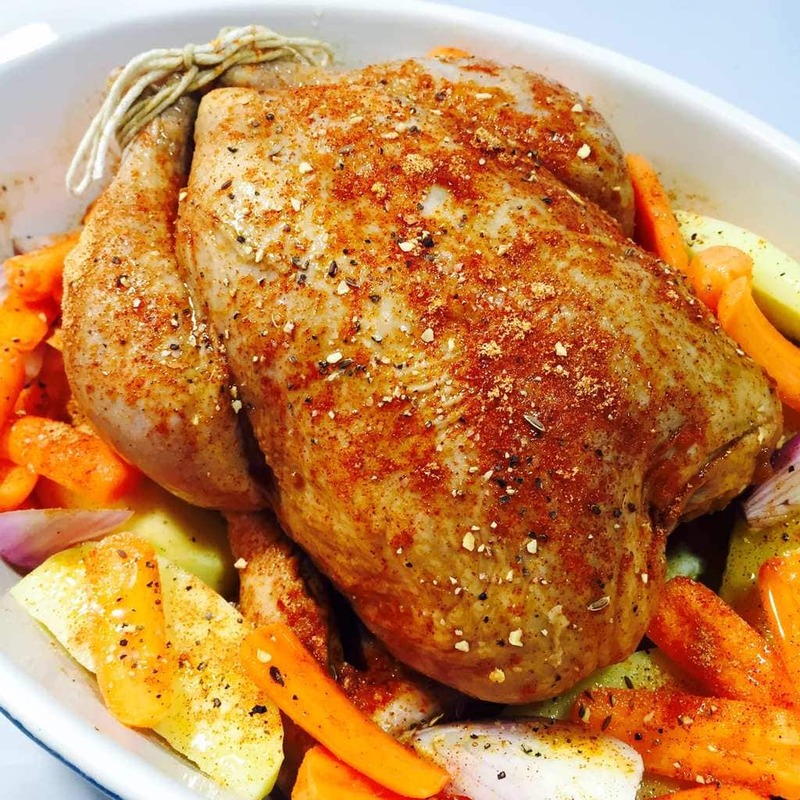 This recipe for the Best Roast Chicken results in a Roast Chicken that is tender and juicy on the inside and beautifully bronzed on the outside. The secret is the Asian Marinade. There are so many recipes for roast chicken. 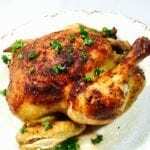 Ina Garten makes her husband Jeffrey a great roast chicken almost every Friday because he loves it so much. I’ve tried her recipe and it’s very good but when I think about the best roast chicken I’ve ever had, I remember one that really stood out. It was one my aunt used to make. I absolutely loved it but I never even thought to ask her for the recipe. It had a slight sweetness with an equal amount of savory. And almost a tang to it. But the thing I remember about it most was the deep bronze color on the outside and the incredibly juicy meat and the flavor of the outside permeated throughout the meat. In trying to duplicate it, I thought it made sense that her chicken had to have been marinated to achieve that kind of flavor. 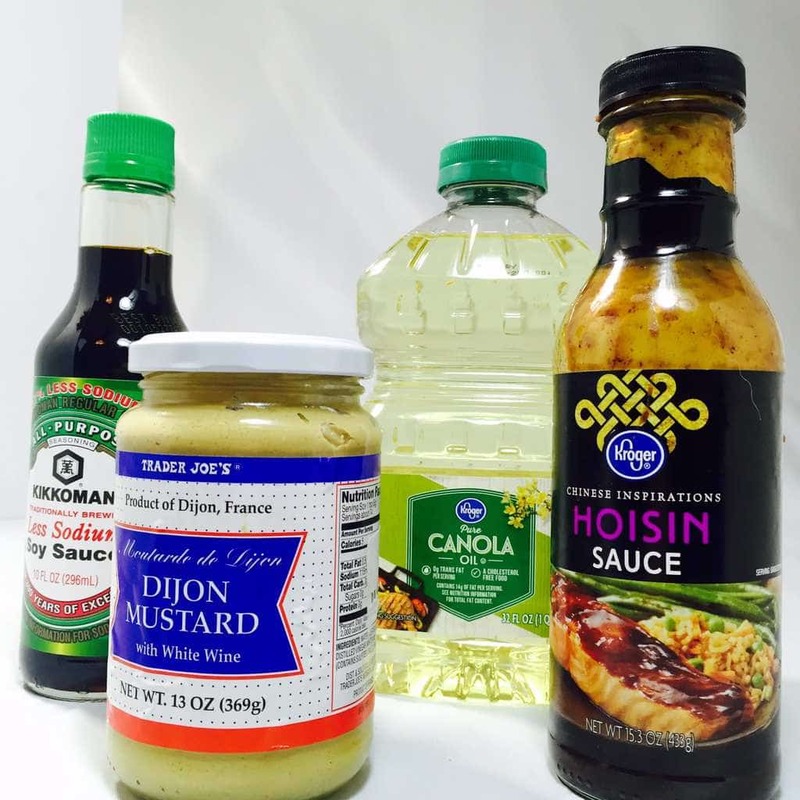 I experimented with lots of different marinades from an herby oil based marinade to a basic Italian dressing to a brown sugar based marinade with lemon to balance the sweetness. None of them were right. Too sweet. Too herby. Too tangy. And mostly they all produced a light brown skin at best. So on to my next experiment, I thought maybe Hoisin sauce since it’s a touch sweet plus savory and I knew that would produce a deep brown color when roasted. Then I added soy and more Asian spices along with a kick of Dijon mustard for tang. But, it needed something more. My aunt’s chicken almost tasted smoky…almost like she grilled it outside. But I knew she didn’t because I remember watching her take it out of the oven. She must have added something else to give it that taste. The closest spices I had to that smokiness was Hickory Smoke Powder, Mesquite Smoked Powder and Smoked Paprika. I settled on the Smoked Paprika. Mixed it in and tasted it and that was it very close to it. After marinading and roasting, that beautiful bronze color was there. And when I carved the chicken and saw how juicy it was, I knew I was in the right track. Of course the truth was in the tasting. And yep, because of that marinade, the flavor permeated the chicken throughout. I know of chefs who feel that a chicken is perfectly fine without washing because they feel that the chicken will be cooked anyway and all the germs will cook away. However, I had a friend who’s Dad owned a chicken farm and he said whenever I make chicken, whatever I do always wash it. So I do. After washing and patting dry with paper towels, place the chicken in a gallon zip lock bag. First, preheat the oven to 400 degrees F. You want the oven to be hot before the chicken goes in. While it’s heating remove the chicken from the bag and thoroughly pat it dry with paper towels and place it in an oiled baking dish. Then truss the chicken by tying the legs together and tucking the wings under. Next step is the spice rub. In a small bowl mix the smoked paprika, pepper, garlic powder and onion powder together. Brush all sides of the chicken with the Lemon Olive Oil. You can substitute with olive oil and a squeeze of lemon, but the blended lemon olive oil is really better for this recipe. Then sprinkle the spice mixture evenly over the chicken on all sides. For extra flavor for both the chicken and for the vegetables, add potatoes, carrots and shallots around the outside edge of the chicken. Then bake it for 60-70 minutes or until a meat thermometer inserted between the breast and the thigh registers 165 degrees. When finished, remove from the oven and cover it with foil for 10 minutes before you carve it. This adds to the juiciness. Wash and pat dry chicken with paper towels. Add chicken to a gallon zip lock bag. In a medium bowl add soy sauce, Dijon mustard, oil, garlic, sugar and Hoisin sauce. Whisk to combine. 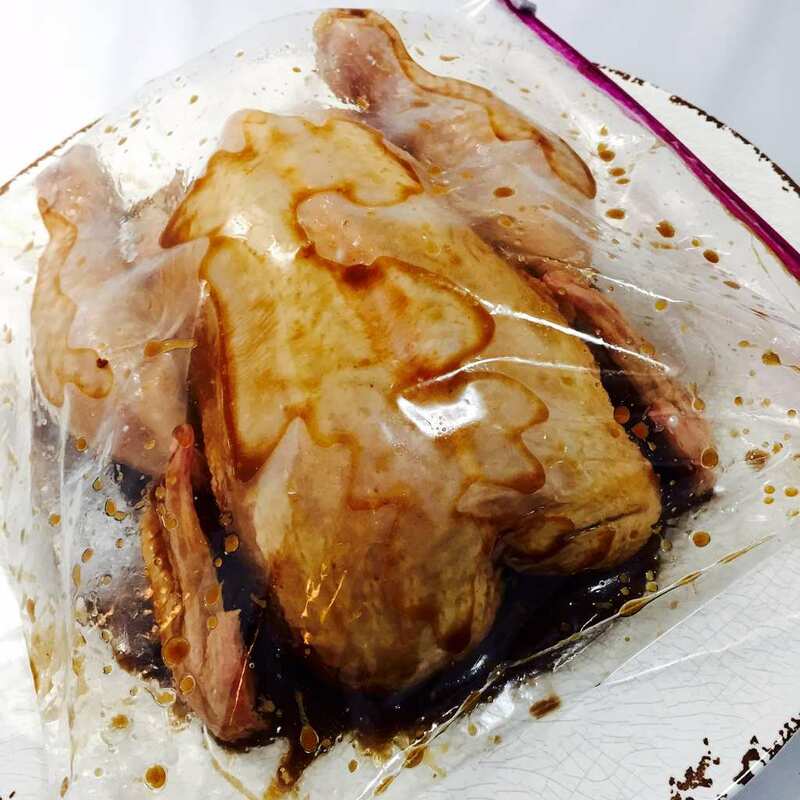 Pour soy sauce mixture in zip lock bag with chicken. Zip the bag and massage the marinade into both sides of the chicken. Add bag to refrigerator and allow to marinade a minimum of 4 hours. Remove chicken from bag. Thoroughly pat dry with paper towels and place in oiled baking dish. Spice rub: Mix sea salt, smoked paprika, pepper, garlic powder and onion powder in a small bowl. Truss chicken legs and tuck wings under. 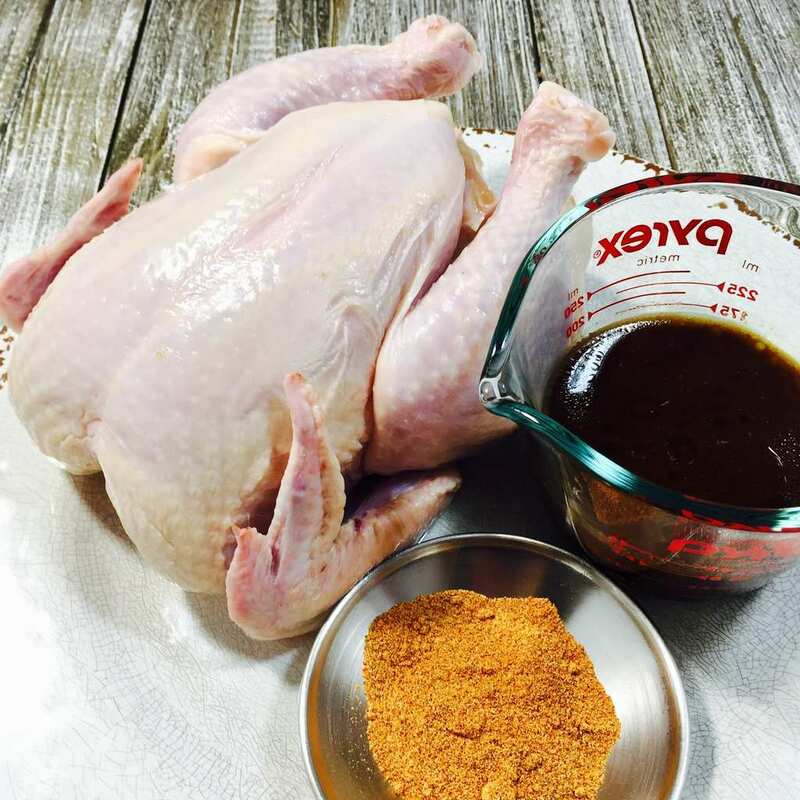 Brush chicken on all sides lightly with olive oil and rub spice mixture over both sides. Add potatoes, carrots and shallot around the chicken and roast 1 hour or until meat thermometer registers 165 degrees when inserted between breast and thigh. When chicken is done remove the oven, cover with foil and let rest 10 minutes before carving.